Q. How do I find the DOI if I only have an ISBN? Most electronic documents published by an authoritative source such as ACM or IEEE will have a DOI (digital object identifier). The University of Fairfax library subscribes to a service called 360 Link that can help you locate information about a digital document, and direct you to the full text of the item if it is part of our digital collections. To use the 360 link tool, click on the Citation Linker from the library's web site, or from the EBook & EJournal Finder. 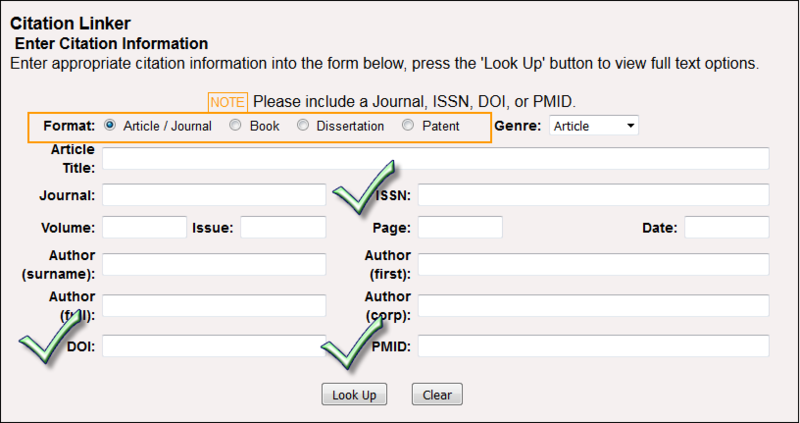 Once at the Citation Linker, input the information you have about the object: PubMed ID, ISSN (for journals), ISBN (for monographs such as books and proceedings), and DOI are the most precise search options. 2398776.2398800: This is the DOI suffix which is composed of character string chosen by the registrant; in this case, the first number (2398776) identifies the proceeding and the second number (2398800) identifies the article in the proceeding. DOI.org: Provides a DOI resolver and extensive information on the DOI framework, system tools, etc. Crossref.org Provides a searchable database of digital object metadata that can be used to identify a DOI or other relavent information about a document.